In the factory, some dangerous chemicals are handled. To prevent accidents, we suggest to install Incombustible patitions. If you have any interests, please feel free to ask us. This transparent fabric is fireproof and does not get burnt up to 1000 degrees maximum. and sometimes it is used for a side sheet of an event tent. We have a variety of fabric, so let us know if you want to have specific fabric! 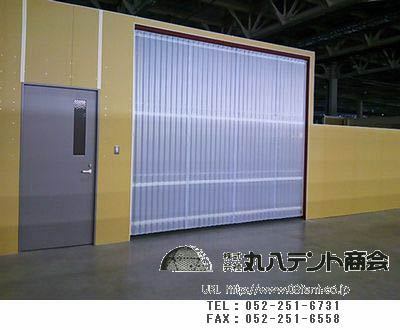 This is a partition tent that we recently installed in a industrial facility. Although transparent, this is fireproof. We go everywhere in Japan, so if you have something to make in your mind just let us know!